I'm Mark Ramprakash of Surrey and England and I'm going to show you how to get the most out of a sweep shot. The sweep shot is played to a ball from a slower bowler that ideally pitches around leg stump. This is one of the most effective shots in limited overs cricket, bringing batsman plenty of runs if played correctly. You need to get a good stride in with your front foot, keeping your back foot behind the crease. Bend the back leg so that you go down on one knee. If you don't try and hit the ball too hard you should score plenty of runs with this shot. To view my sweep masterclass in full, click on the icon above. Ramps hit 204 not out as a 13-year-old for Bessborough CC at the National Cricket Association Guernsey Festival in 1985. Mark scored 63 not out against Yorkshire on his Middlesex debut. 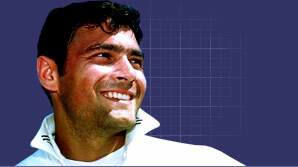 He was voted the Cricket Writers' Young Cricketer of the Year in 1991 and made his Test debut against West Indies at Headingley. He took over the Middlesex captaincy in 1997, but by 2001 he had made the move across London to Surrey. He continues to be in-and-out of the England side, but is recognised as one of the leading batsman in the country. Dive into Jonty Rhodes' fielding tips!